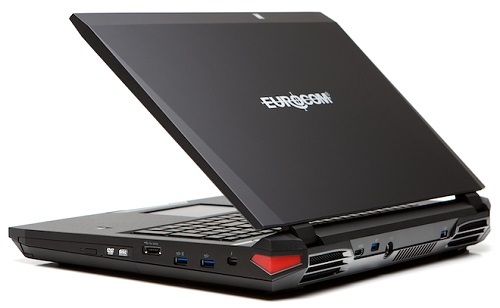 The 17.3” EUROCOM X7 is the most powerful, fully upgradeable desktop replacement on earth with support for two high performance NVIDIA GeForce GTX 780M mobile graphics and up to Intel Core i7-4930MX processors. The new set of drivers from NVIDIA provide our users with more performance, stability and image quality while playing the most demanding games like Battlefield 4 and Call of Duty: Ghosts. Below we have compiled a series of benchmarks to illustrate the awesome performance of the EUROOCM X7, with two NVIDIA GeForce GTX 780M graphics cards and the 331.65 driver. Weighing only 4 kg, with a built in battery, display and keyboard the X7 combines ultra performance with a small form factor, all in one design for gaming on the go. Being fully customizable and amazingly flexible, the X7 can be filled with a plethora of top quality, high performance technology. Starting with support for dual graphics cards in SLI, 4th Generation Intel Core i7 processors up to i7-4930MX, up to 32 GB memory and support for up to 5 storage devices the X7 was designed from the bottom up to perform. Personalize your own X7 weapon with a custom backlit keyboard, with 7 colours, 3 zones and 8 modes you have the ability to dominate and stand out. A sleek, customizable light illuminates the keyboard, hinting at the power held within the aggressively designed chassis. Enjoying the latest game is all about visuals and sound. The X7 supports beautiful full high definition 1920x1080 matte displays. High definition audio, ONKYO sound and Sounds Blaster X-Fi enables users to hear the enemy creeping up behind them. Eurocom tested the NVIDIA GeForce GTX 780M SLI graphics in the X7 with the impressive results below.